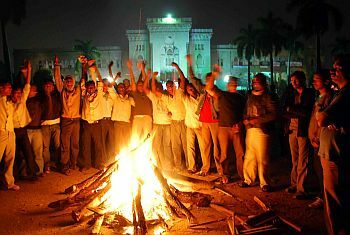 Rediff.com » News » Celebrating New Year, the Telangana way! Celebrating New Year, the Telangana way! 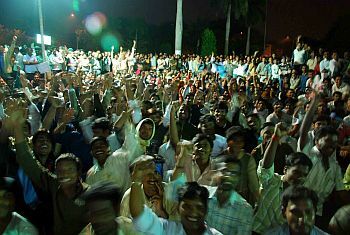 The students, youth and agitators from different sections of the society, fighting for a separate state of Telangana, welcomed the new year 2010 in a unique way, highlighting the culture and folk art of the region in their night-long vigil and celebrations. The Osmania University campus in Hyderabad, which has emerged as the nerve center of the Telangana movement over the last month, throbbed with Telangana's music, folk dance songs as the students holding burning candles in the cold night continued their vigil till the wee hours. The Students Joint Action Committee had given a call to mark the New Year eve with 'Telangana Jagran' and thousands of students and youth turned up at the campus. Artists from various folk groups performed and paid tributes to the martyrs of the Telangana movement. As the popular song 'Veerulara Vandanam' echoed, people danced to the folk tunes. As the majestic building of Osmania Arts College provided the backdrop, the students vowed to make 2010 the year of formation of the Telangana state. In another part of the campus, young girls and women gave glimpses of Telangana's cultural heritage by performing Batukamma dance and organised Bonalu festival. One of the grievances of the Telangana people is that the influence of a different Telugu language and culture of coastal Andhra region had corrupted Telangana's own culture, and pushed their customs and festivals into the background. 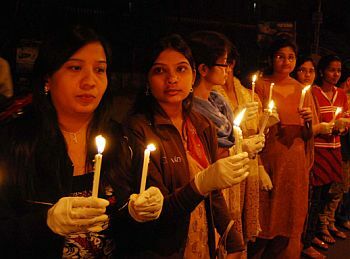 Nurses at the Gandhi Hospital organised a candle light vigil in support of Telangana state to welcome the New Year. 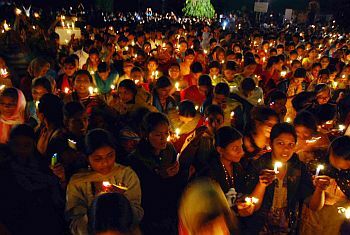 The Warangal Kakatiya University also witnessed a similar night-long vigil and cultural program. Thousands of students also celebrated the New Year in Telangana style at other universities in Mehbubnagar, Nizamabad and Karimnagar. 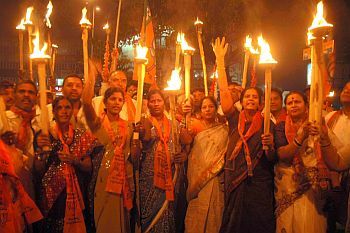 In Hyderabad, the Bharatiya Janata Party also organised a torchlight rally on the Tank Bund. It was led by the state BJP president Bandaru Dattatreya. On the other hand, the traditional New Year Celebrations were held at five star hotels, clubs and resorts under the shadows of tight security as some organisations had threatened to disturb them. However, the occasion passed without any disturbances.